Groundhog fun at a previous parade. ESSEX — Grab your pots and pans and head to Essex Village this afternoon, Sunday, Jan. 28, at 2 p.m. for one of the most popular parades of the year. 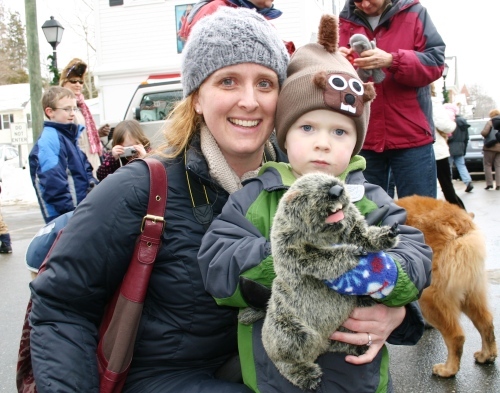 “Essex Ed”, a larger-than-life ground hog, will make his annual pilgrimage from Essex Boat Works on Ferry Street up to the top of Main Street leading a parade of antique cars, fife & drum corps, residents, and visitors. 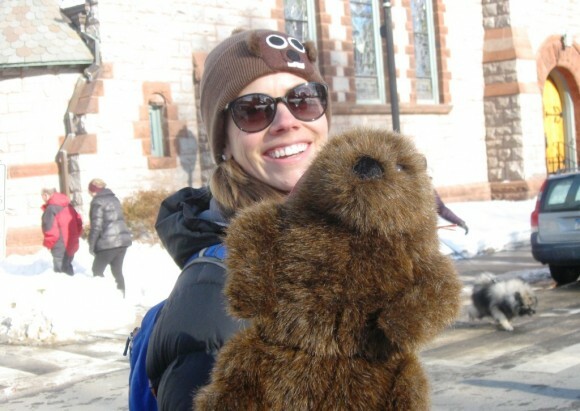 Immersed in the spirit of the parade, this marcher posed with her personal groundhog. All are invited to join in and encouraged to bring their own noisemakers and ground hog gear to celebrate the day. Each year, Essex Ed is dressed in unique attire to acknowledge a special occasion or person. As always, this year’s costume is a secret but organizers guarantee that it will be a “huge hit” when Ed makes his appearance.